Many who read our pages are deeply involved in community improvement projects. Some of you are consultants who want to tout a successful community betterment undertaking, and others are simply passionate about your particular success, hope, or instructive failure of a neighborhood, block, or citywide enterprise. Most of the stories of what works and what fails in community development are lost to others who are trying to address a similar issue or opportunity. A few stories are told over and over, but as wonderful as the Harlem Children’s Zone may be, for example, the context in other cities makes it impossible for everyone to replicate one positive example. That is why it would be so helpful for those who work in neighborhood organizations, block units, community development corporations, or in city planning, economic development, or sustainability consulting to get busy in giving us more case studies and short anecdotes about what is happening in community building around the world. Learning is contagious. You do not have to be a brilliant writer or even know what conclusions to draw. In fact tell your story in mid-stream because in community work, most sagas do not have a tidy beginning, middle, and end. Just relaying the history and facts as you know and see them will help other people. On our home page we talked about how much fun community development and community improvement projects can be. That little note of optimism probably is important there, but it is equally true that working on your community can be frustrating, slow, and tedious. Often it feels as though you take one step ahead and then some other problem pops up. It is a fortunate neighborhood indeed—although they exist and they are very welcome on this site—where there is only one subject that needs attention, and where people have both the will and the money to fix it promptly. Commonly the cleanups and the special events to promote your town and your businesses need to continue on a periodic basis, with no end in sight. So learning how to make those events go as smoothly as possible is an effective use of your time. These tips will seem obvious, but it’s surprising how often people forget these simple truths. 1. Address something that enough people see as a need. Too many requests for help will generate volunteer burnout. The need might not be obvious, especially if it’s a social need or something that pertains to a hidden corner of the neighborhood or powerless part of the population. The test is: when it’s explained in just a sentence or two, are people eager to help? If not, reframe the problem statement, move on to a different topic, or prepare to create change all by yourself. If you see something as a clear need, and your community does not respond, perhaps you need to create an educational campaign as a starting point. 2. Take the time to plan a community betterment course of action that is likely to lead to success. Wishful thinking is the enemy of accomplishment in neighborhood activity. To want a grocery store doesn't make it viable to have one. 3. 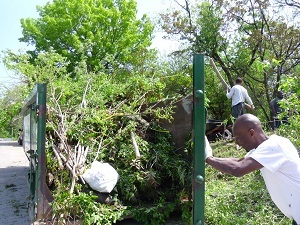 For one-time community improvement projects, usually you must only answer test 1 above. However, if the idea will require sustained effort, take the time to build a formal or informal organization or small group that will dedicate itself to the task. Usually your progress won’t be linear, meaning making community progress in a straight line. People need enough passion to stay with you if things don’t go exactly as planned. If you don't have experiences to share with others yet, and you need more inspiration about possible projects, see our community development ideas page. Creativity comes about (among other things) when two disparate ideas come together, sparking something new for you. We hope that through contributions from the web, we actually add to the knowledge base about how to make community improvement projects ever more successful and interesting. The pages that you can generate quickly and easily by telling us what you know will help others think about their own neighborhood issues more objectively, and you can enjoy bragging a little about your great crew. Think how proud they will be to show up on the web. At least we hope so! Use the form below to enter your thought or experience on community improvement projects. Thanks for helping out other volunteers and even professionals who are having trouble coming up with a great idea. Please let us know what worked and what didn't work as a betterment project. Understand that a project might be a task easily accomplished in a morning or a years-long activity. You can also write about opportunities, issues, and policy propsals to your heart's content! The result is a web page, with comments possible. Note that we edit for clarity and sometimes to add our own thoughts on what you've said. TIP: Since most people scan Web pages, put your best thought in your first paragraph. Do you have photos or graphics to add? Very helpful! Click the button and find the first one on your computer. Select it and click on the button to choose it.